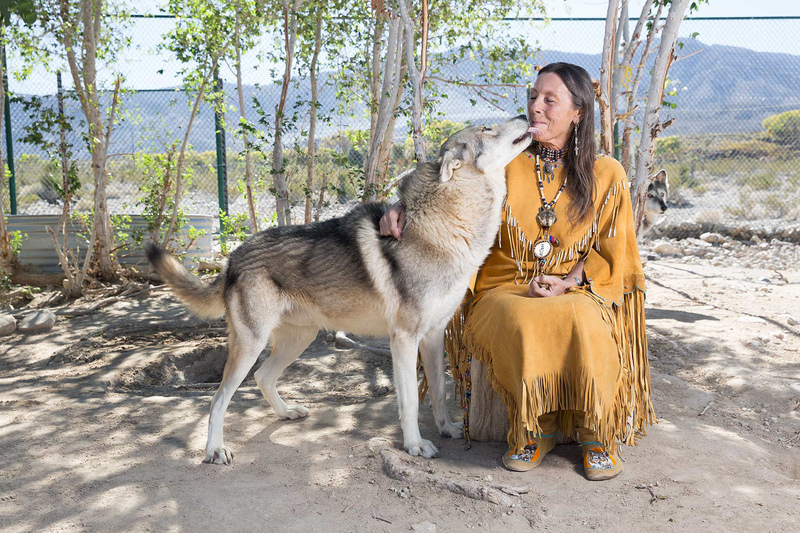 Meeting someone who has been around wolves since she was born isn't exactly common -- but for Tonya Littlewolf, a.k.a. Mamawolf, a life spent in the company of these elegant creatures is perfectly normal. She has, indeed, made it her mission to defend and protect the animal she calls her "spirit brother." Originally from New Mexico, Littlewolf is part Chiricahua Mescalero Apache and part Sicilian -- "not a good combination," she jokes. Her grandfather first brought her into the wild to meet the wolves and cougars they were spiritually connected to- she formed an instant bond. Years later, Littlewolf founded the Wolf Mountain Sanctuary in Lucerne Valley, California, east of Los Angeles, to teach the "hairless pack" (humans, that is) that they need to live in harmony with wolves. "We work together," she says. "The wolves are here for the circle of life -- the streams, the trees, the flowers, the birds. We walk with the wild." Commune with it, too. Littlewolf's affinity for animals, and vice-versa, is readily apparent: Birds alight on her shoulders; coyotes drop their innate skittishness around her. As for the nine wolves in her pack -- yes, it's her pack, and she's the alpha female -- she speaks to them. Part Apache, part English. To an outsider, it's bizarre -- but the wolves' loyalty and respect for her are evident. Littlewolf's gift for appreciating these fierce yet misunderstood predators is never clearer than when witnessing the gentleness and affection they display in her presence. Dangerous? Well, maybe -- but these majestic creatures, which can weigh 130 pounds or so when fully grown, turn to putty in her company, scrambling to make their way into her lap like pups a tenth their weight. The admiration is mutual: "I feel comfortable with some people," Littlewolf says, "but I feel safe with the wolves." To learn more you can arrange a visit to Littlewolf's sanctuary or donate, please visit www.WolfMountainSanctuary.net.